Home/Blog/Skytap Product/Let Your Geek Flag Fly! As die-hard fans of cloud computing and everything technology-related, we felt like Geek Pride Day was an appropriate time to wave our geek flag all across the interwebs. ​Celebrated on May 25, the date for Geek Pride Day was chosen to commemorate the release of the first Star Wars film, A New Hope, on May 25, 1977. It also shares the same date with two other fan holidays: Towel Day, for fans of The Hitchhiker’s Guide to the Galaxy trilogy by Douglas Adams, and the Glorious 25th of May for fans of Terry Pratchett’s Discworld. In a Geek Pride Day survey by Modis, 61% say they would purchase and wear a smart watch (a computerized wristwatch with Smartphone functionality), and 56% percent say the same about smart glasses (glasses with Smartphone and camera functionality). The survey also found that geeks are perceived as more than just smart. When asked which characteristics they associate with geeks, a majority of consumers said that geeks are hard working (76 percent) and confident (58 percent). Are geeks more likely to be gainfully employed? Yes. Seventy percent of respondents who self-identify as a geek are employed, compared to only 54 percent of non-geeks. 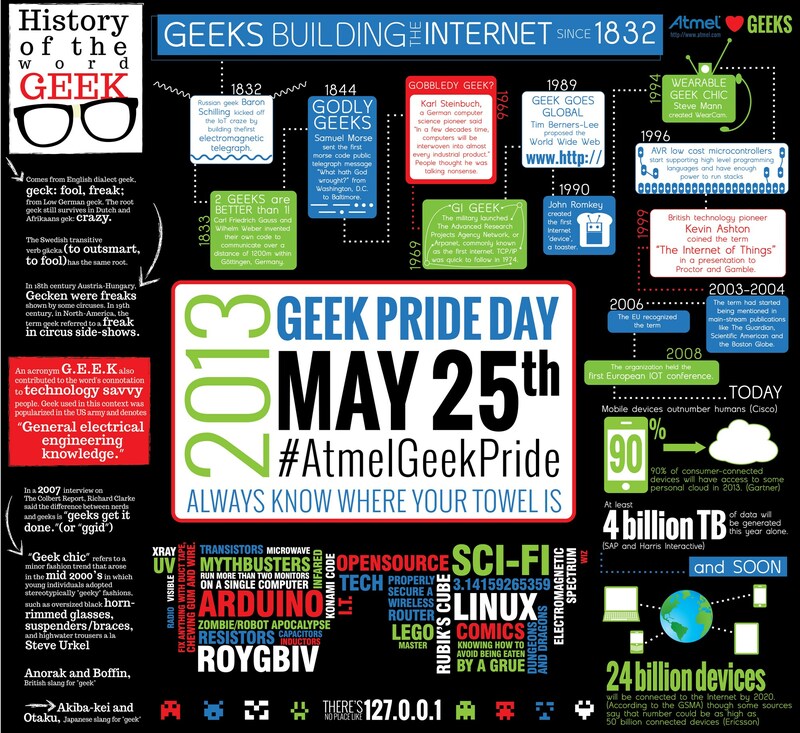 How else are people celebrating Geek Pride Day 2013? ThinkGeek has been shipping Geek Pride pins since May 7 for people to wear. Alas, they have sold out, but they also provide a handy pdf version of the pin that you can print and appropriate. They will also be randomly choosing 3 mystery box prize winners and 5 runners up who will each win a ThinkGeek gift certificate. Events! There are Geek Day-inspired events taking place across the U.S.—well, the world actually. AnimeCons galore—from Boston to San Antonio; MCM London; and Meetups everywhere. And if you can’t celebrate in person, at least tweet about your love of lightsabres, towels, and lilacs. The #GeekPrideDay hashtag is already throwing sparks.